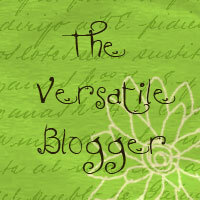 Last week I was very honored when Alicia Street gave me the “Versatile Blogger Award.” Thanks, Alicia! The award has several stipulations. One: I have to tell you seven random facts about myself (see below). Two: I have to post the lovely logo on my site, which isn’t a problem because I love pretty, shiny things. And three: I get to pass it on to other bloggers. 2.) My favorite book is Jane Austen’s Persuasion. Hilarious. Delightful. Perfect. 3.) The only thing that bugs me more than people who don’t use their turn signals (I’m not a mind-reader!) is people who wear pajamas in public. If you’re well enough to go to the grocery store, you’re well enough to wear actual pants. 4.) I hate peaches. Don’t know why. Just do. 5.) I love roses, especially coral roses. 6.) I am NOT a morning person. Monday I wrote 958 words. Today I wrote 615, bringing the total to 1,573. I tried the old trick of opening a blank Word doc and seeing where the muses take me. It worked out nicely tonight. Working on my goal of blogging Wednesday, Friday, and Sunday. Congratulations on your award. It’s great to be recognized by your peers isn’t it! You’re very welcome for the award. And anytime you want to borrow “delightfully quirky” feel free! Congrats on your award. I like delightfully quirky. and we are alike – mornings should be outlawed. Persuasion is one of my favorites, too. And I’m a morning person, but Roy is practically a vampire. That actually came in handy when living in tiny NYC apartments. Good luck with your writing goals. I used to be a night owl, but I swear I’m trying to reform. Thanks for the award. It’s my first blogging award, and I’m very honored. I am not a fan of peach skin–that fuzziness creeps me out in a big way, but I can eat them if they’re peeled. Weird, huh? Yeah, fruit that’s fuzzy freaks me out. But I still can’t eat peaches if they’re peeled. Maybe it’s a texture thing? Congrats on your award, and thanks for mine. Good luck with your writing goal.